Getting LEGO to sell minifigures of groundbreaking and prominent female NASA pioneers would be a small yet important step in setting the record straight on the impact of women in space exploration. Dozens of women have taken flight in outer space and many more have been integral in the behind-the-scenes research and technology that goes into successful space travel, but their names are often much less recognizable than the men in the space program. 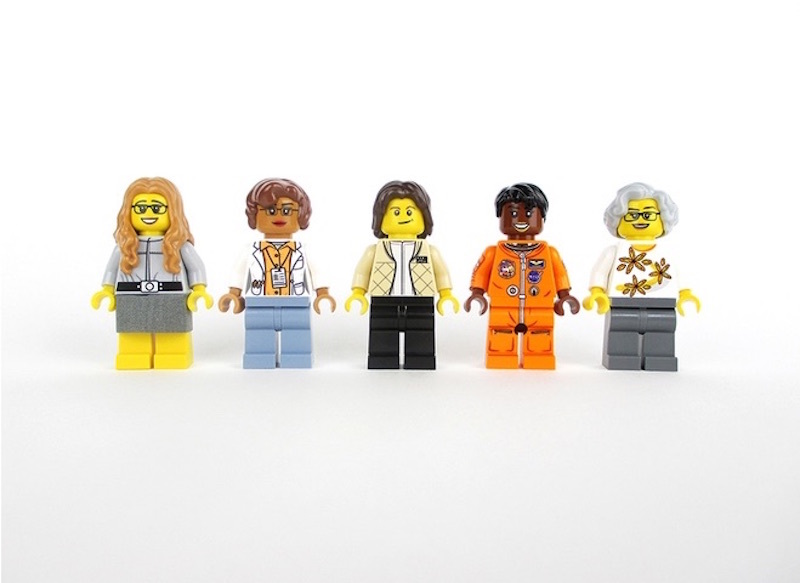 Artist, editor, and "LEGO tinkerer" Maia Weinstock wants to educate us (and our kids) by highlighting the accomplishments and contributions of five women in NASA history: Margaret Hamilton, Katherine Johnson, Nancy Grace Roman, Mae Jemison and Sally Ride. If the women behind some of these names are as unknown to you as whether water can exist on Mars, read on and then lend your support to make this amazing set a reality. Computer scientist Margaret Hamilton is credited with popularizing the modern concept of software and developed the on-flight software for the Apollo moon mission. Katherine Johnson, a mathematician, and space scientist was integral in calculating trajectories for numerous space flights. 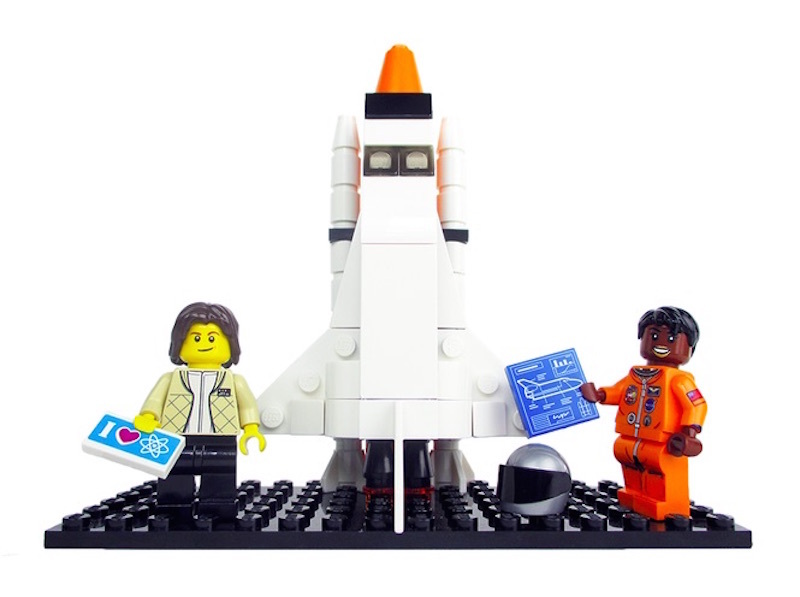 Astronaut, physicist, and educator Sally Ride is arguably the most well-known of the proposed minifigure set. She encouraged girls to pursue STEM way before the trend caught on. Dr. Mae Jemison was the first African-American woman in space. Since retiring, she has continued to develop new technologies and encourage the next generation to explore the sciences. Astronomer Nancy Grace Roman is known as the “Mother of Hubble” for her part in developing the Hubble Telescope. She also had a major role in creating NASA’s astronomy research program. In addition to the minifigures themselves, the proposed project includes props such as computers, reams of code, rockets, a telescope, and other NASA essentials. Weinstock has submitted ideas to LEGO before, including her awesome female Supreme Court Justices, which the company declined due to the proposal’s political nature, and the Bioneers, in support of women in the field of bio-engineering. This idea has quickly gained support: as of today, it had over 5,000 supporters, including NASA itself — (halfway to the 10,000 needed for official LEGO review). Add your name and show your love for these amazing and groundbreaking women. Computer scientist Margaret Hamilton is credited with popularizing the modern concept of software and developed the on-flight software for the Apollo moon mission. Katherine Johnson, a mathematician, and space scientist was integral in calculating trajectories for numerous space flights. Astronaut, physicist, and educator Sally Ride is arguably the most well-known of the proposed minifigure set. She encouraged girls to pursue STEM way before the trend caught on. Dr. Mae Jemison was the first African-American woman in space. Since retiring, she has continued to develop new technologies and encourage the next generation to explore the sciences. Astronomer Nancy Grace Roman is known as the "Mother of Hubble" for her part in developing the Hubble Telescope; she also had a major role in creating NASA's astronomy research program. In addition to the minifigures themselves, the proposed project includes props such as computers, reams of code, rockets, a telescope, and other NASA essentials. Weinstock has submitted ideas to LEGO before, including her awesome female Supreme Court Justices, which the company declined due to the proposal's political nature, and the Bioneers, in support of women in the field of bio-engineering. This idea has quickly gained support: as of today, it had over 5,000 supporters, including NASA itself -- (halfway to the 10,000 needed for official LEGO review). Add your name and show your love for these amazing and groundbreaking women.